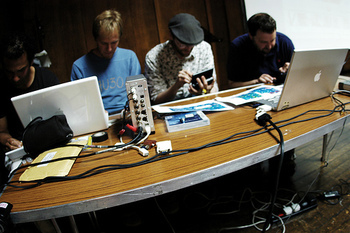 Some of the less observant of the Interesting2007 attendees may not have noticed but the afternoon scone break saw the world premiere of a new work by The Electroplankton Quartet (pictured above courtesy of Curtis.) 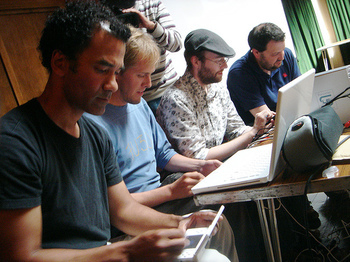 (Electroplankton is a music game for the Nintendo DS, which is what we were playing.) As you'll hear from the recording of that performance that Iain's put on our new MySpace page it was a bit of a mess. UPDATE: Iain's done an ambient remix, and put all the individual parts here as a zipfile if you'd like to do your own. I like this. It's like side 2 of Low. If Bowie had decided to play Super Mario half way through. Will there be a reunion tour? There *should* be a tour. With projected visuals on giant screens.